Mostly in the US, but maybe also in Canada, Greyhound (the large bus network) partners with local carriers. However, the information about the partner carrier is limited when searching a schedule on Greyhound website (only a 3-letter identifier was given). Recently, I have searched the full itinerary of bus lines for a carrier indicated as CLI or another as PRC. I used a search engine to figure the first was Concord Coach Lines and find their network and schedules. 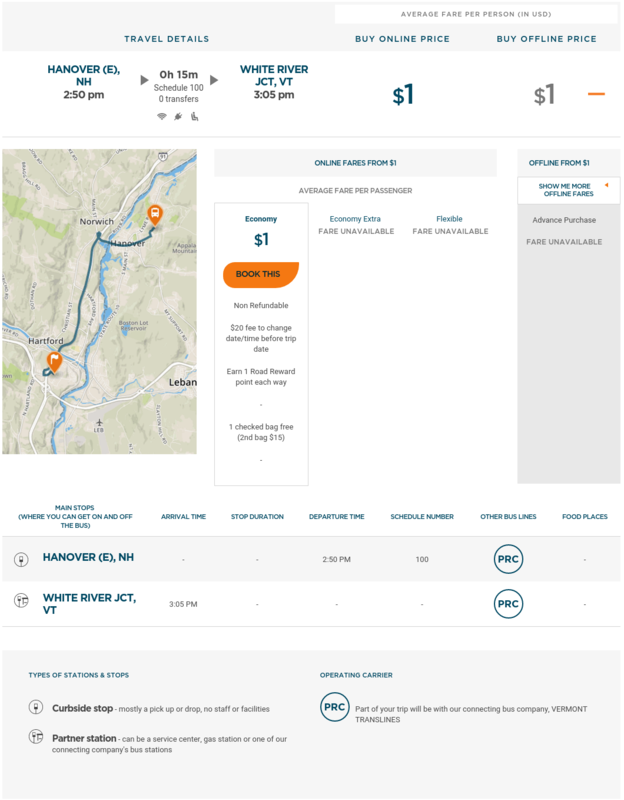 However, I cannot figure this information for the carrier PRC, which seems to run a daily service between Hanover, NH and White River Jct, VT. Is there a catalog of the partnering bus carriers or does someone know specifically what carrier PRC is, and what is their network and schedule? There's no (public) complete list of Greyhound's partner bus lines, as far as I know. But PRC appears to be Vermont Transit (aka Premier Coach). The one daily schedule you mentioned leaves Hanover, NH at 2:50 pm, arriving in White River Junction at 3:05 pm. This corresponds exactly to Vermont Transit's schedule. Concord Coach Lines and Vermont Transit are well known around here, as they provide services to New Hampshire and Vermont towns that Greyhound skips over (as they like to focus on larger cities). Since this was written, Greyhound has redesigned their website, and now tells you the name of the partner bus companies when you select an itinerary. Not the answer you're looking for? Browse other questions tagged usa buses greyhound vermont or ask your own question.